PRESERVE YOUR NEIGHBORHOOD, YOUR SLEEP AND YOUR SANITY. MaryMount’s 24-story Project On 97th-98th St. Attend / Send Letters for the 01/27/14 S.L.A Hearing! Excerpt of latest 10/19 flyer (click image for full PDF). This is a direct link to the updated flyer with the above correct address AND CONTACT INFO FOR LOCAL POLITICIANS; please print and email and distribute widely (and contact those local politicians: THEY WANT TO HEAR FROM YOU (click here for contact info). As the CB occasionally changes the location, agenda order and speaking rules, please check back to this page frequently, or better yet, “follow us” and/or email us to sign for updates and we will keep you informed with the latest info, including info on registering to speak in opposition to Earl’s Beer & Cheese’s expansion into three backyards with a sixty seat beer garden…. 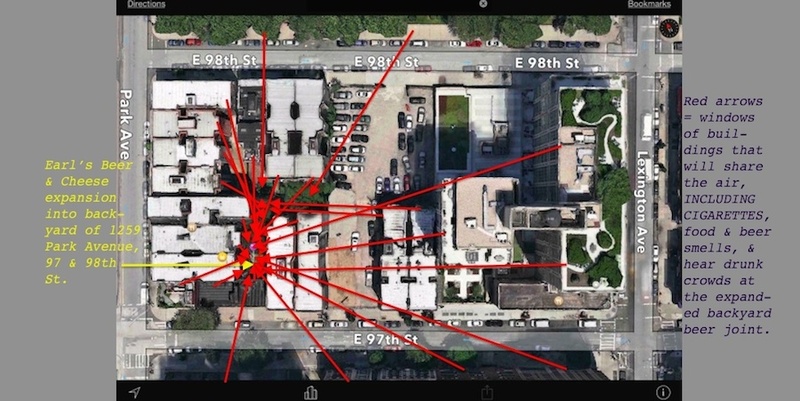 Above shows buildings will be affected by noisy drunks, kitchen odors, and cigarettes from Earl’s Beer & Cheese putting a SIXTY SEAT BEER GARDEN into THREE backyards at 1257-1261 Park Ave. (97th & 98th). (click image to enlarge). REMEMBER: once this bar expands, others will follow, turning the neighborhood into a hive of beer joints, raising storefront rents, & driving out non-alcohol based businesses. Please also mark your calendar for Wednesday, November 5th (6 pm) as that will be the next meeting of the CB11 Licensing Committee meeting; depending on what happens tomorrow night, might come up in front of that committee again. Please reach out to us (a) and tell us that you can attend tomorrow night, if you wish to walk with your neighbors to the Community Board meeting, and (b) please also get back to us with your email and/or phone info, (if you have not done so already), so we can stay in touch and get you more info as it comes in. FIRST IT'S JUST A BAR IN SOMEONE ELSE'S BACKYARD. STAND WITH YOUR NEIGHBORS TO PRESERVE YOUR NEIGHBORHOOD. YOUR SLEEP, AND YOUR SANITY. Please consider helping us to defray our costs. Your donation will help pay to host this page, pay for fliers, faxing, and transportation to and from Community Board and NY State Liquor Authority hearings! No donation is too small. Thank you! NY SLA Denies Outdoor Beer & Wine Permit To Earl’s Beer and Cheese! “They Might As Well Brick Up Our Windows!” Recording of SLA Hearing.